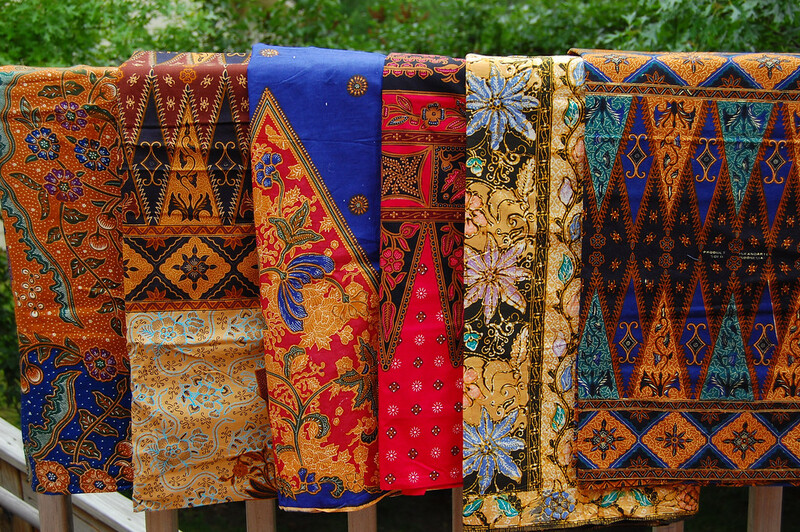 In light of our coming trip to Singapore, I thought I'd share what sewing looks like in our culture. Because I'm getting all sentimental and nostalgic, I mean. Singapore is a melting pot of so many different races and nationalities (Chinese, Malay, Indian, Europeans, Eurasians etc) that it is hard to define what our cultural identity is as a people. Contrary to popular belief, we are not part of China! But we were part of Malaysia at some point in history and as a result have a lot more in common with Malaysia and Indonesia, culturally. Singapore is a super-humid tropical island that's overcrowded with people, so we wear shorts and light cottons a lot. But it is such a mix of old and new and modern and traditional that it is also common to see people in up-to-date designer outfits jostling on the trains with folks in various traditional cultural wear. 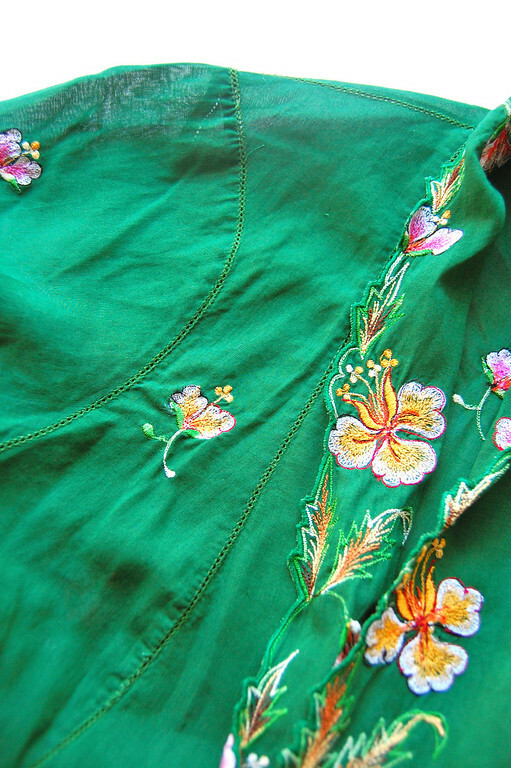 One of our more formal national outfits is the sarong kebaya, which older ladies like my grandma wore a lot of. Grandma embroidered many of these when she was still living but somehow they were all lost, save one. 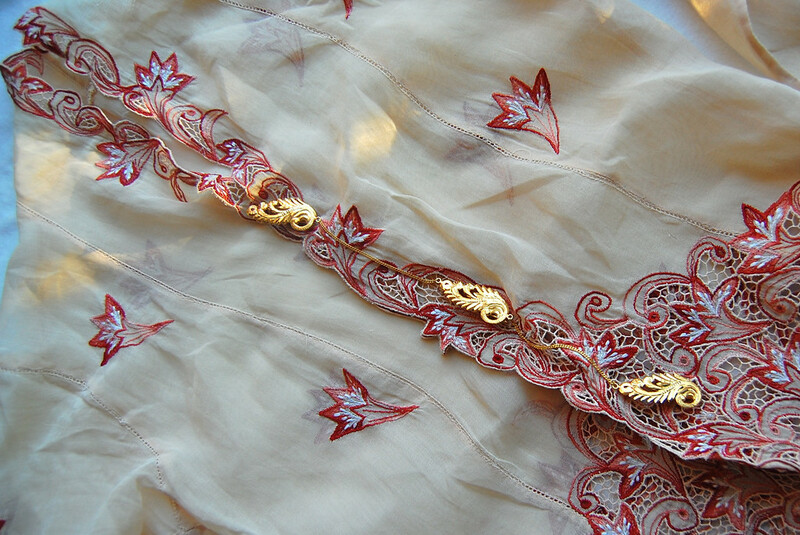 wrapped snugly (not pre-sewn) to form a skirt, and fastened at the waist with a metal chain belt. 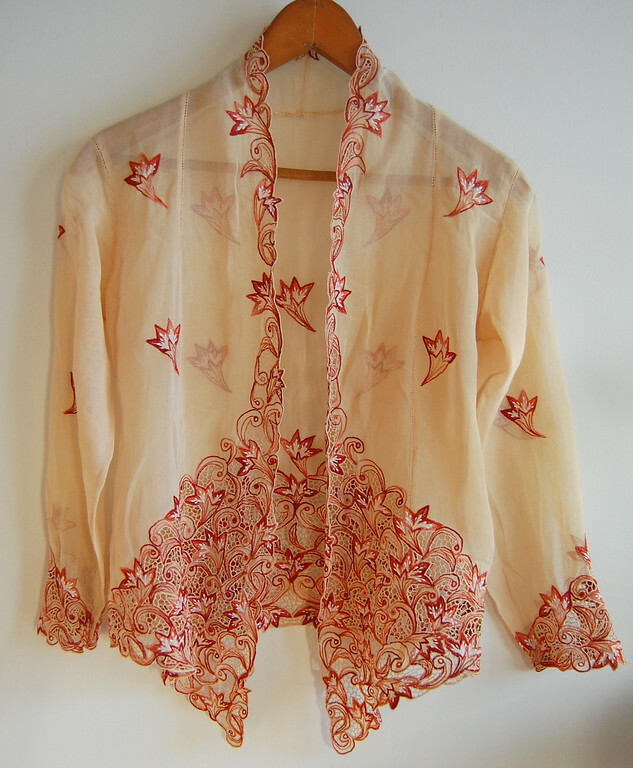 The second is the kebaya , which is a translucent blouse worn over a lacy undergarment and a midriff-covering cummerbund. 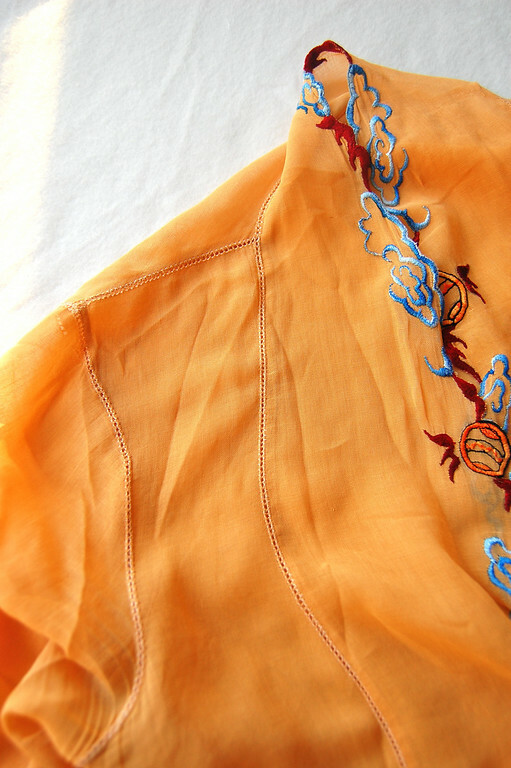 The best kebayas were made of soft voile and tailored to fit the individual. They were expensive back then, but now even the cotton machine-sewn ones cost hundreds of dollars. I found these at a thrift store years ago. A thrift store! Unbelievable. 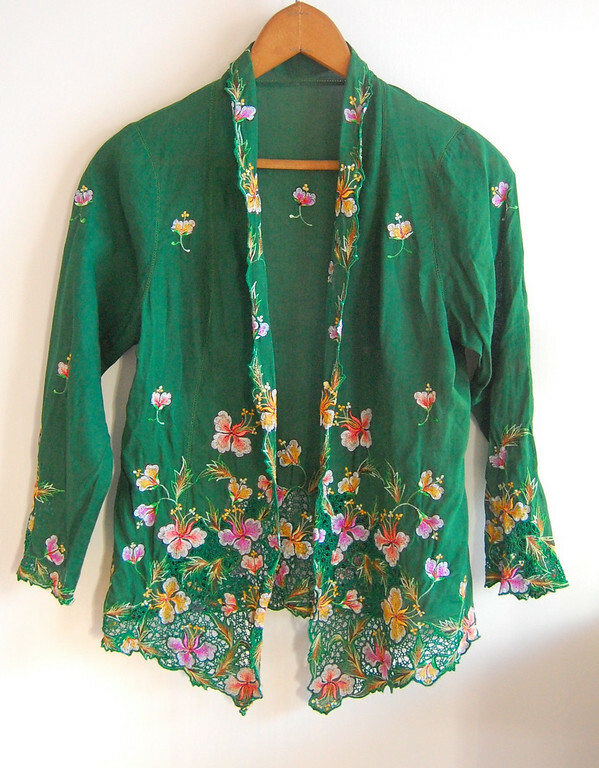 I bought the whole lot in a sentimental fit because they were so very like the ones grandma made. This next one is the one grandma actually embroidered, and that we managed to save. 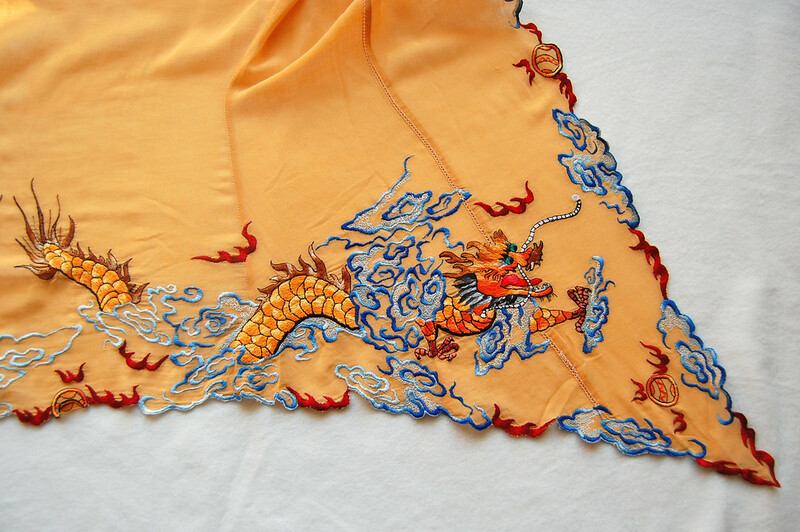 According to my cousin, grandma saw this dragon design in a dream one night, woke up, sketched it out and embroidered it. If only my dreams were this useful. and in a modern variation after the kids were born (couldn't fasten the front with all that extra post-natal weight!) over a velvet cami and velvet skirt. 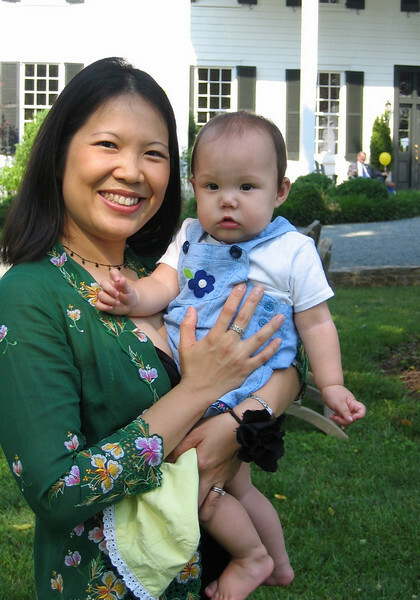 Look - there's Emily at 11 months! So all that was preamble to the main point of this post - to share what free-motion embroidery is like in our family, at least as defined by grandma and, later, mum. Grandma did this on an old treadle machine, not by hand - till this day I marvel at her precision, control and skill in manouevring her embroidery hoops back and forth under the steady up-down-up-down of the machine needle. 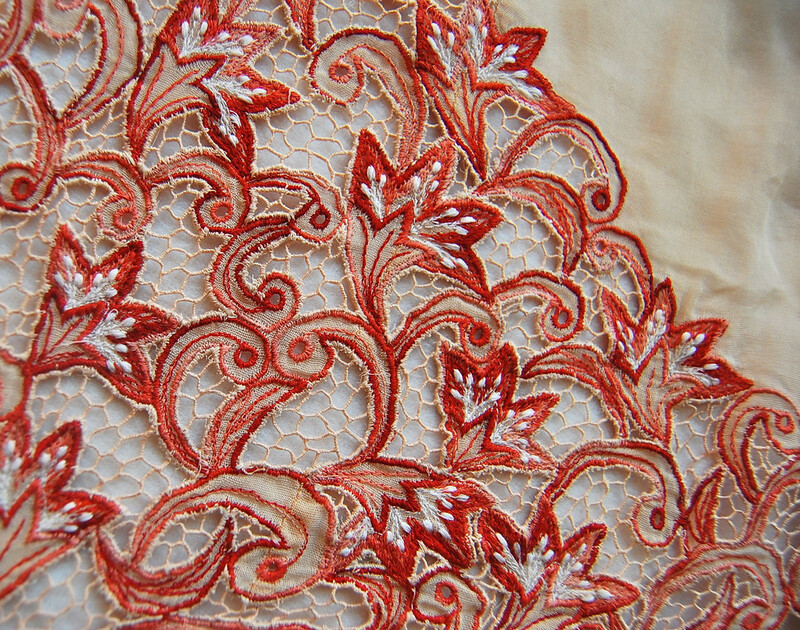 Here is a more elaborate technique of free-motion embroidery, called cutwork. 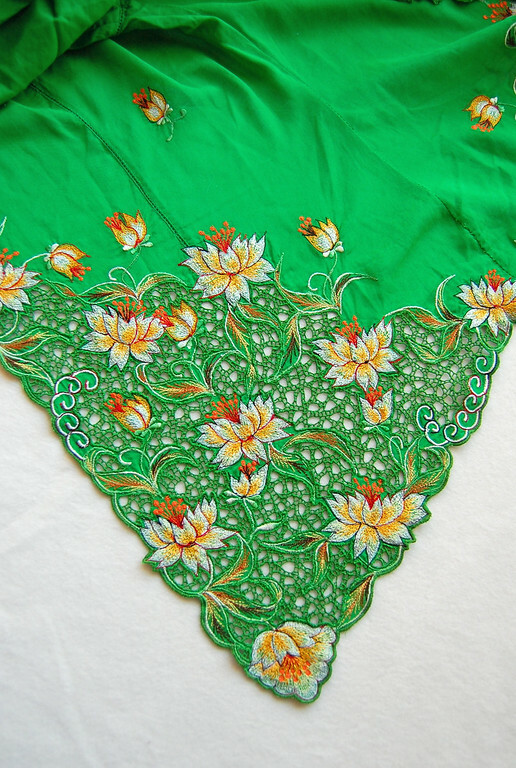 It is done by sewing a border design, then cutting out small holes in the fabric, stitching weblike lines across the holes and then satin-stitching over those threads to reinforce them. Then more holes are cut and reinforced, until the entire pattern is complete. Crazy intricate. 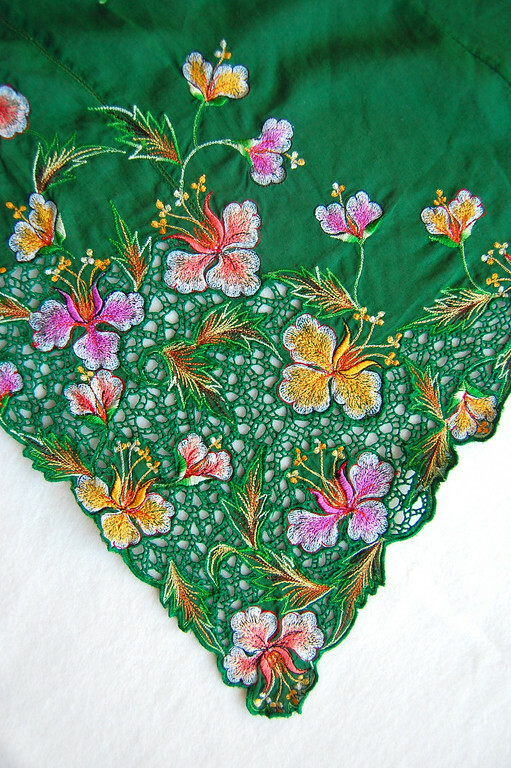 Grandma taught this to mum (her daughter-in-law) and mum made an entire tablecloth out of free-motion cutwork embroidery. It took her a very long time, obviously. I'll take a photo of it when I am in Singapore - it is a sight to behold. 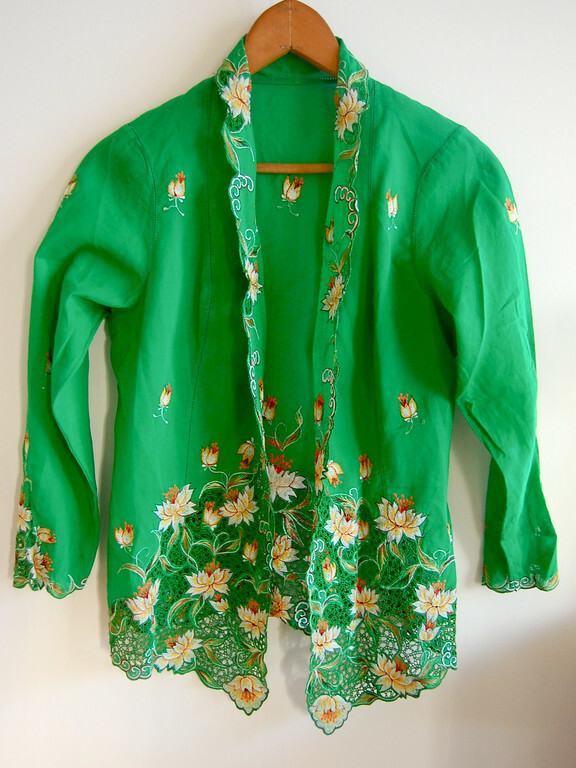 I was never really interested in free-motion embroidery as a young person, which was a shame. Now that I am motivated to learn it, I don't have my old treadle machine. Minus the cutwork, this can probably be replicated on a computerized embroidery machine but, as mum explains, it looks stiff and machine-sewn, and lacks the soft, imperfect handmade look of manual embroidery. But sometimes I wonder if this has influenced my disinterest in print fabric and my love for anything textured. After having watched grandma and mum create such multidimensional richness on their machines, it's hard to get really crazy about flat fabric, no matter how beautiful the print. But that's just me. 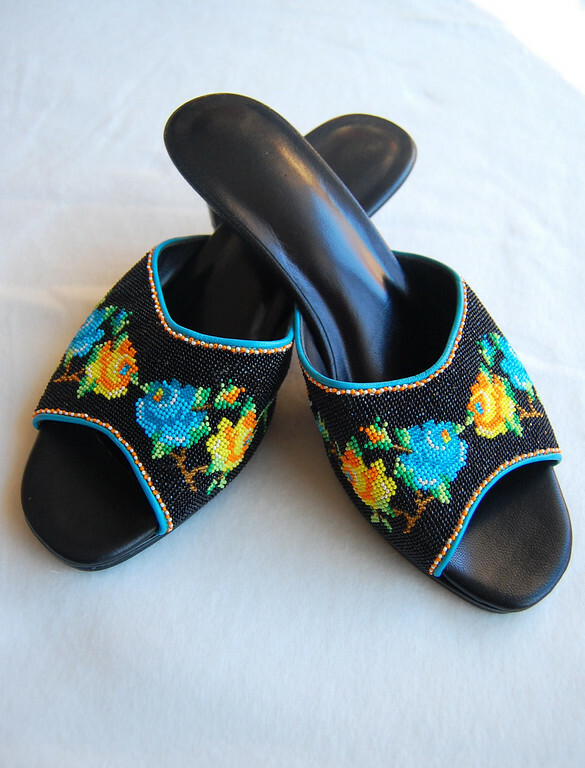 And finally - here is my measley cultural contribution: the kasut manek, or beaded slippers, which are worn to complete the outfit. Funnily enough, they took me five years to make because I gave up halfway, so this would be my all-time longest project! These are very fine beads - smaller than the smallest seed beads in fancy bead stores (yes, I've searched!) 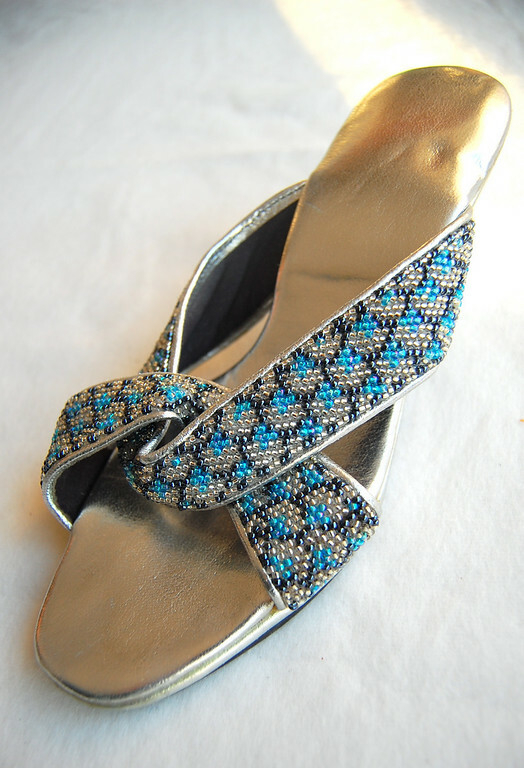 - but the really vintage slippers were made of even tinier glass beads which are now no longer available. 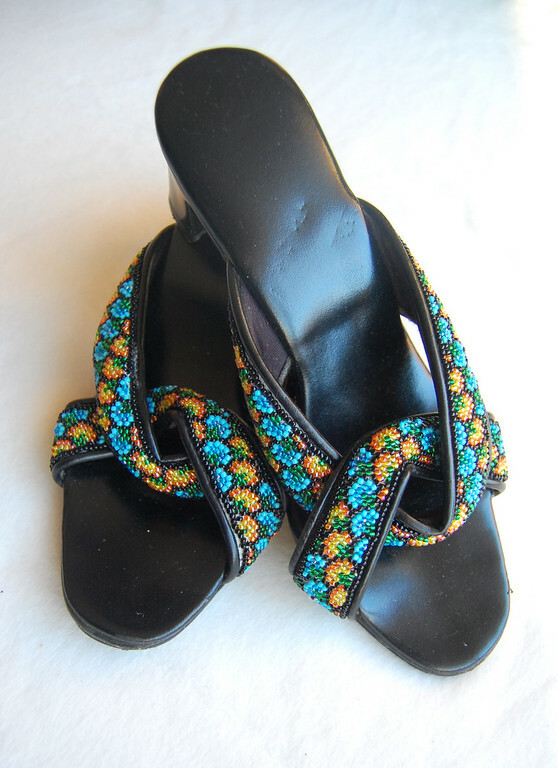 The uppers were beaded on a wooden loom and then brought to a cobbler somewhere in Chinatown to turn into leather slippers. 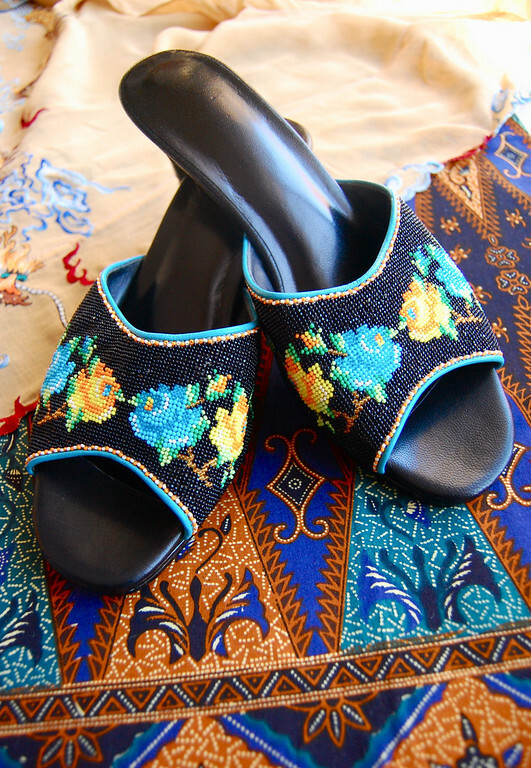 but that mum bought anyway because I was walking around in my sarong kebayas and wearing modern pumps while not making any progress on trying to finish beading my slippers. A fashion disaster in the cultural sense! Thank you for letting me share a bit of culture with you! Back to our normal program now! 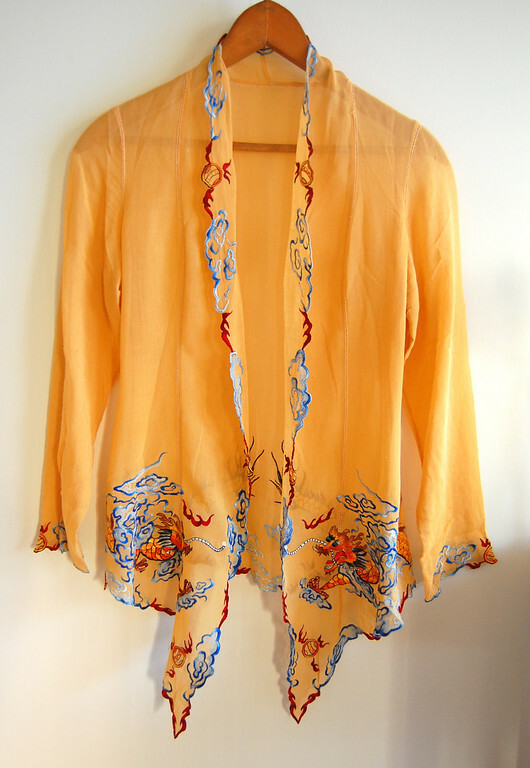 The machine embroidery is fabulous. Did they use an embroidery foot on the machine? Do you know if there are "how to" instructions anywhere online? I have a treadle...a lovely machine but I use it mostly for quilting. WhiteStone: yes, I think I remember grandma and mum using a special embroidery foot, and they had a smooth metal plate over the feed dogs. 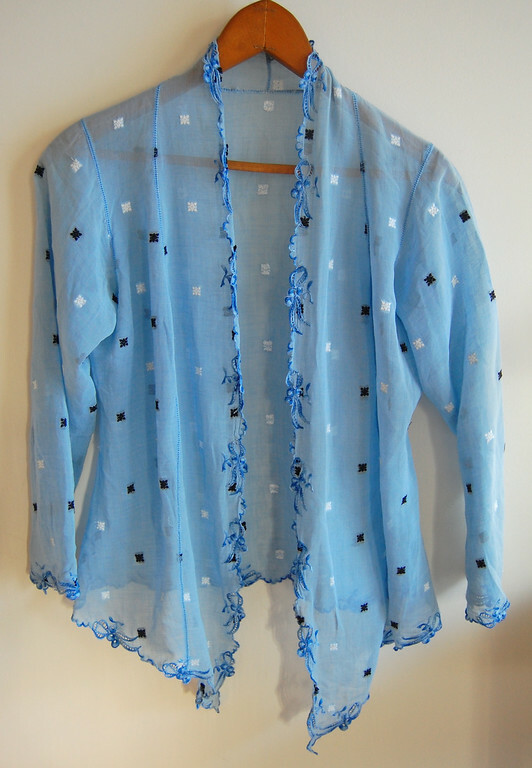 I think if you google "cutwork embroidery" you might get some tutorials. What stunning work! 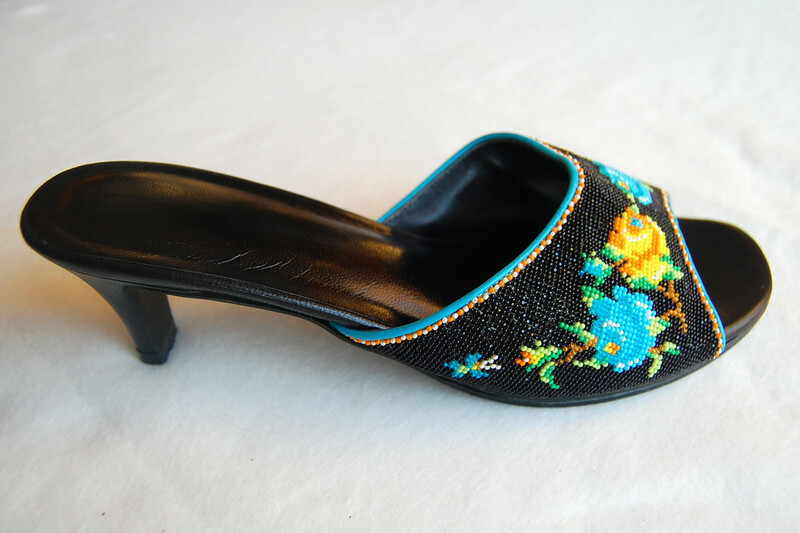 Your shoes are gorgeous, and I love all of the tops! How do they make those pretty princess seams? And your grandma's dragons are my absolute favorite of the bunch! Can't believe she did that on a treadle sewing machine. how fascinating. My head is screaming, " I want to learn!" But I keep telling it there is enough to be done without learning something new! ha ha! Love the pics to give us a better idea of details! (and dontcha just love thrift store treasures!) I dont get to go often but my most fav. find was a whole silk case of old knitting needles of various sizes and brands! I gave half to my daughter and kept half which we display in antique canning jars. Wow, everything is just stunning. I'm blown away by the fact that the embroidery was done on a machine but by a person...the precision is truly amazing. Thanks for the info about Singapore, too; I am realizing how little I know about so many places on Earth. Wow, what a treat to get to see and hear this first hand. I feel culturally enriched. Discovered your blog recently and I must admit ... I am hooked, engrossed, totally interested, amazed. You make me want to be a better, mom, seamstress, historian, etc. Thank YOU--it was fascinating to learn about these techniques told through your own story. Not to mention the examples are stunning! Wow, this is so amazing! Thank you for sharing this part of your family and your culture. Beautiful! Wow! All of that was such a treat to see! I would love to see it actually being made. There are so many things that I want the chance to be an apprentice of. You have a fabulously talented family! And you are too of course! what wonderful treasures you have! And history to go with it! 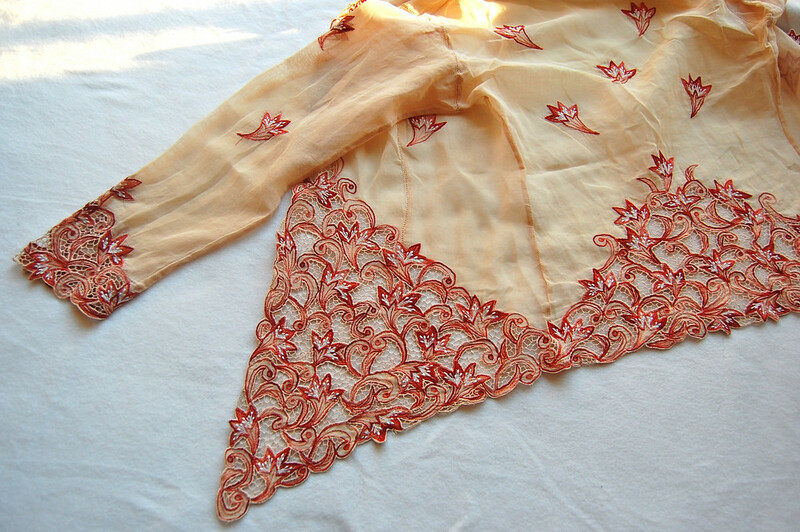 I love the embroidery but glory be, I'd really love to be able to do those seams. I've never seen anything like them. How on earth are they worked? I loved reading this about your culture. Thanks for sharing. Absolutely breathtaking art work! Thank you so much for sharing your family's treasures. Stunning, simply stunning. I love embroidery and I'm not even good at it with a needle, so this machine stuff is just breathtaking. What a heritage you have! I hope you do try your hand at it and then tell us about it! Thanks for all the photos of the beautiful beautiful work. your granny was really v creative and artistic! thanks for sharing.